An interesting map showing Kingswood as part of Wiltshire. This image is taken from an 1787 map of Gloucestershire. 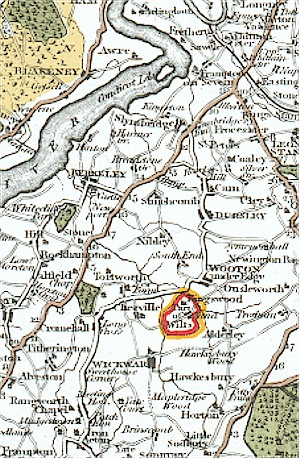 Inside the red and yellow circle around Kingswood it says "Part of Wilts" - right in the middle of Gloucestershire! It was quite common to have "islands" of one county within another. Kingswood (Wotton) became part of Gloucestershire in the middle of the 19th century. These sort of anomalies go back a long way and were being rationalised in the mid 1800s. It may be that Kingswood was connected with the Berkeley family - perhaps a tax dodge or a place of safety for people fleeing from Gloucestershire. In 1227 Kingswood was placed in the ownership of the Abbey there. For a tribute of 10 marks King Henry III confirmed this and stated that it was to be "free of all and every secular tribute and service and immunity from arrest". For even more information, see "About Kingswood" ISBN 0 948254 52 1 written by the Kingswood Village Historical Society. This map section was published by John Carey of Arundel St, Strand, and was one of a series reproduced in facsimile in the 1980s. Thanks to Linda Barraclough (kapana@netspace.net.au), and to John Cordwell (cordwell@clara.net). Do you have any more information on this map? Send us an email and we'll include your contribution in this article.